Rhino Gear makes internal spur gears for a wide range of equipment applications, whether your need is custom or off-the-shelf. Internal spur gears, also known as ring gears, have the same standards as an external spur gear except that the teeth are cut into the inside diameter while the outside is kept smooth. 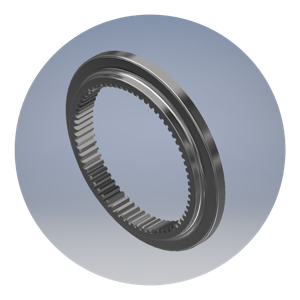 Internal gears can provide a compact solution that delivers large speed reductions and reduced sliding wear action. When it's necessary to have two parallel shafts rotate in the same direction, internal gears eliminate the need for an idler gear. Internal gears can be applied in a wide range of equipment and applications. Copyright ©2013-2018 Potesta & Company, LLC. All Rights Reserved.